The gold market has made a good rally since the 11/30/2018 Chaos Clinc suggested it was about to rally. This initial rally could be part of a longer term move. One of the dominant astro cycles in Gold is the Saturn-Node (SO) cycle. This 11.4 year cycle is close to the average solar sunspot cycle, which has been linked to several economic cycles. Gold is used as a hedge against market uncertainty. Stock market uncertainty seems to be one of the reasons for the rising prices in gold. 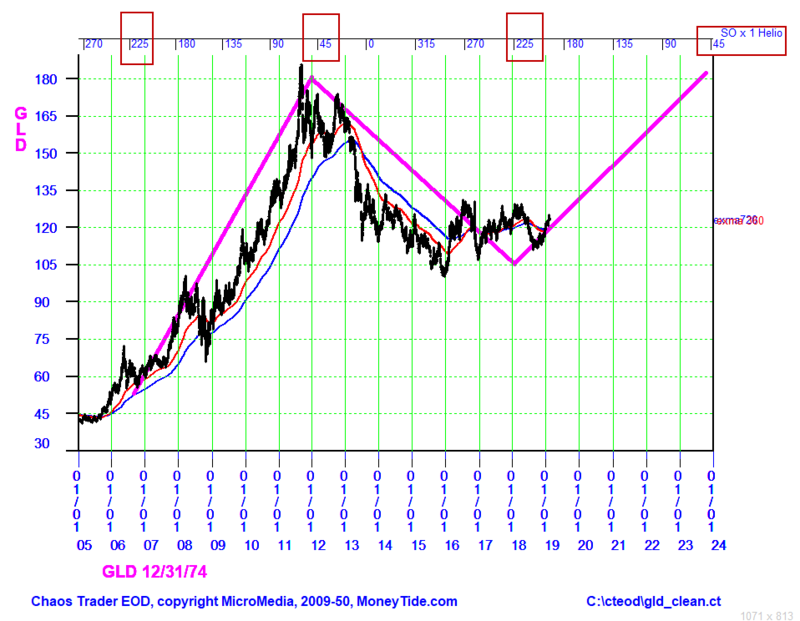 This chart of the GLD Exchange Traded Fund shows a possible version of the SO cycle. Cycles can turn near any major aspect. The SO cycle looks to be making turns near the 225 and 45 degree cycle aspects. Often these turns are hard to see because of shorter term cycles. This seems to be the case with the current turn. However, this can be helped by using longer term exponential moving averages. On this chart, the 360 and 720 calendar day EXMAs are turning up, having tracked near a price of 120. These EXMAs are higher than they were two years ago. Also, the 2018 low is higher than the end of 2016 low. This is evidence that a longer term cycle is turning up. Cycles tend to have equal time moves. An up SO cycle could run into the end of 2023. A retest of the 2011 high would bring prices back up to 180. Depending on world events during the next 5 years, they could go much higher. For investors holding GLD, the guide line should be to stay long as much as possible. while using prudent stop loss methods. A strategy of buying the dips may also work.